In most galleries and museums, visitors are usually discouraged from touching the art or even getting to too near it, especially if the piece in question is a painting. However, the Public Art Fund has just announced an upcoming outdoor art project consisting of an abstract mural that not only allows you to touch it, but to slam a rubber ball against it. 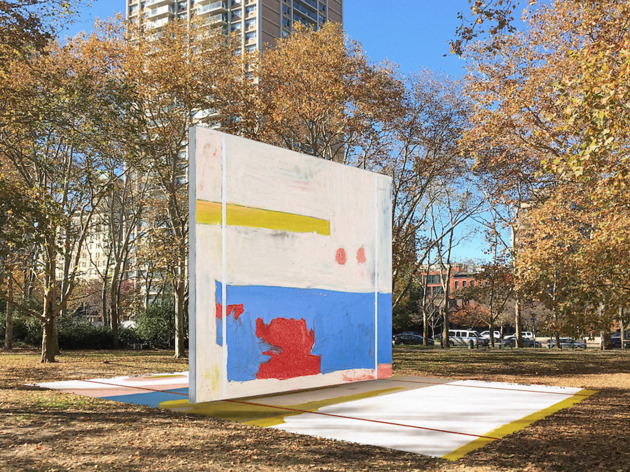 Opening May 1 in Brooklyn’s Cadman Plaza Park, Subliminal Standard, as it’s called, consists of the aforementioned painting on a freestanding, 16-foot-high concrete wall that serves as a playable handball court. It’s the brainchild of Brooklyn-based, Belgian-born artist Harold Ancart, who found inspiration in the city’s many outdoor handball courts. 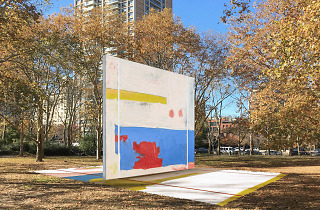 The installation is painted in the blue and red standard colors used to delineate areas of play, while it’s overall funky look is meant to suggest a handball court after years of wear and tear. Ancart plans to paint the wall on site, allowing people to watch its creation. Subliminal Standard will be on view until March 1, 2020, leaving you plenty to try your hand at having a ball with a real work of art.